Trappro humanely removes foxes that have invaded your yard, shed, barn, under porch or house or other areas of your home. Foxs will be trapped and removed. Trappro will trap fox throughout Maryland, Washington DC or Northern Virginia. Our professional trappers will also be able to seal up areas in shed or under porch and home where fox have entered the home. 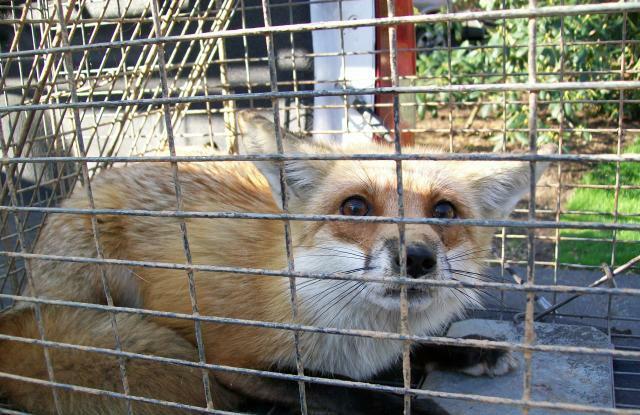 Trapping and exclusion of fox is available for homeowners and business owners throughout Maryland, Washington DC and Northern Virginia. Description: Foxes are some of the slyest of mammals. They range from small to medium size and resemble the physical characteristics of a dog, coyote, wolf, or jackal. Foxes have a flattened skull, upright triangular ears, a pointed and slightly upturned snout, and a long bushy tail (also known as a brush). They're mostly shy and secretive animals, but are also considered to be very cunning. Foxes are very smart when it comes to protecting their young, finding food, outwitting predators, and surviving throughout the extreme climates. The fox has sense capabilities as accommodating as hearing animals that are underground! Food Sources: Foxes are scavengers in the sense that they will eat whatever they can find. They will dig into gardens, garbage, and even pet food consuming everything from worms to small domestic animals. Foxes tend to hide and store their food to aid in getting them through times when food sources are not as available as they'd prefer. Life Span & Reproduction: Foxes begin breeding in the earlier months of January and February. They carry their young for approximately 2 months; sometimes a little less. The mother fox then gives birth to four to five deaf and blind pups. For the following 4 to 5 weeks, the female fox stays with her young while the male fox performs his duties hunting and gathering. Around the 4 to 5 week mark, cubs are developed enough to venture out of the den. They are forced to fend for themselves, learning the skills to serve them as a full adult by the Autumn season. At that time, they begin their own separate life. The female fox is fully able to reproduce once she reaches 10 months old. Foxes can survive in many diverse habitats ranging from deserts to suburban areas. The fox is an extremely resourceful animal. Unfortunately, though so resourceful, foxes only average a lifespan of 2 to 4 years in the wild. Typical Areas of Entry: Foxes generally feel the need to make more than one den to aid them for different purposes. The main den, which typically is equipped with several entrances and exits, is used primarily for breeding. The smaller dens usually have only 1 entry or exit point and have a tunnel that lead it to other dens. The fox is capable of digging its own burrow, but usually prefers to make their home in burrows and dens previous animals have abandoned. As such, they often find shelter in or under human-built structures. Typical Treatment: First, a thorough inspection by a Trappro technician will be completed. At that time, the area(s) of entry will be identified and trapping/removal will commence. If activity on a human-built structure is found, trapping would proceed for approximately 3 to 5 business days to work as our first line of defense. Live cage traps will be set near/on the entry/access points. The open areas where the fox have gained entry will be monitored for activity during the duration of the trapping service. The technician will place a breakable barrier/screen/tape (whatever is available) over/inside the holes or entry points to monitor the fox movements in/out of the open areas. This technique allows us to record wildlife movement and will assist in dictating the duration of the trapping service. Once a point of no activity has been reached, Trappro will feel comfortable removing the live traps and installing temporary screenings over the existing entry points. The trapping/removal service, along with our patch, is guaranteed against animal re-entry for 30 days. Trappro recommends permanently sealing the fox area(s) of entry. Upon the inspection, a proposal will be provided for permanent repairs to the home or structure. Trappro completes and warranties permanent repairs against wild life re-entry for up to 10 years. If foxes are simply inhabiting or invading the yard with no specific point of entry, Trappro offers an open area trapping service for these purposes. Open area trapping is difficult simply because Trappro cannot force animals in to a trap. The exterior of the home is their natural habitat. Foxes can only be baited to then further lead themselves inside before they are able to be removed from the property. Open area trapping services last for a total of 7 business days and hold no guarantee. Any animals/wildlife lead inside our traps will be removed. Trappro does not charge per animal or per trap. Dangers: Attacks on humans are rare with the fox. Foxes are extremely calculated in their moves, however, sometimes accidents do happen such as stumbling into a living space. At that time, a fox's first thought would be to find an exit as soon as humans are detected. Even in cases where a human may be close to the den of a fox, a fox is more likely to guide the person away by escaping them than attacking. All of that being said, foxes can become aggressive when cornered feeling as if they need to defend themselves while in their territory. It is recommended to always proceed near a fox with caution. The biggest concern when dealing with foxes is disease. They are carriers of rabies and a bite can cause spread of infection. Their defecation can also spread bacteria as it dries. Humans, as well as domestic animals, all run the risk of being infected by a diseased fox. Call Trappro TODAY! Have your fox intrusion on the road to resolution!